After watching Jo’s Quick Holiday Gifts Webinar, I knew I had the perfect way to make my son’s t-shirt quilt. 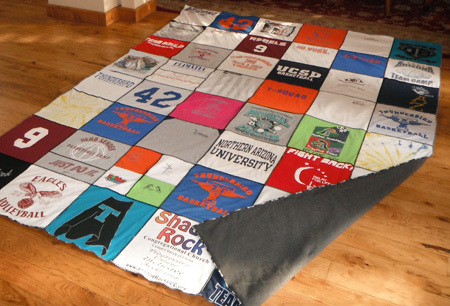 Combining ideas from the t-shirt scarf and the patchwork fleece blanket, I was able to finally use the t-shirts I have been saving into a great memory quilt for my son. I cut 14″ squares, combining any shirts that were not big enough. I used a 3-thread flatlock serger stitch to put the squares together. My original plan was to make it back-to-back with just t-shirts (since it doesn’t normally get that cold here in Arizona), but my son is 6’4″ and after putting the two halves together, I decided it would be better to use all of the shirts on the front. I backed it with sweatshirt fleece (no batting needed); it is just perfect that way, and the fleece is a good match for the t-shirts. I tacked the front to the back at each corner with the “button sew-on” stitch, going over it a second time to make it very secure. Once it was backed and trimmed I used a 3-thread overlock stitch with variegated thread around the outside edges. I can’t wait for him to open it on Christmas morning! Yeah, Mary Lou! I am sure Greg loved it! We are so proud of you! I am new at quilting. And I was just wondering if anyone could give me any easy tip on putting the batting in the quilt. I have finished my first quilt but haven’t got it together yet. I really don’t know how to do it. Some say to tape it to the floor then pin it. But I have a 4year old that is always into what I am doing. Help please!